The safety of a product depends on how you use it. A confusing mix: some of these products can be applied to skin, others should not under any circumstance contact skin while wet. 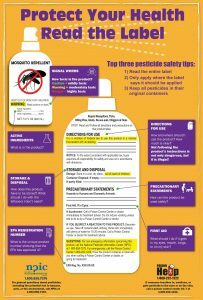 Read the label before using any pesticide product. Products with the active ingredient permethrin can actually kill ticks and mosquitoes. According to one label, “This product must not be applied to clothing while it is being worn. Under no circumstances should bare skin or clothing on the body be treated.” In other words, if you’re going to use permethrin, you have to treat your clothing or gear before you intend to use it so the pesticide can dry. According to the label on one product, this may be two to four hours. We want you to enjoy the outdoors—and we want you to do it safely. Both types of products can be used to protect you, your friends, and families from the bite of blood-feeding organisms. To further protect health, always read and follow label instructions. 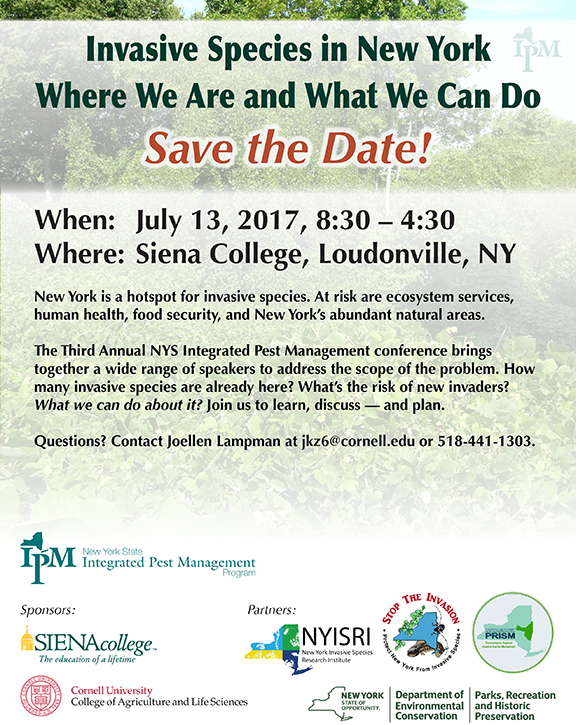 NYS IPM: How do I protect myself from ticks? 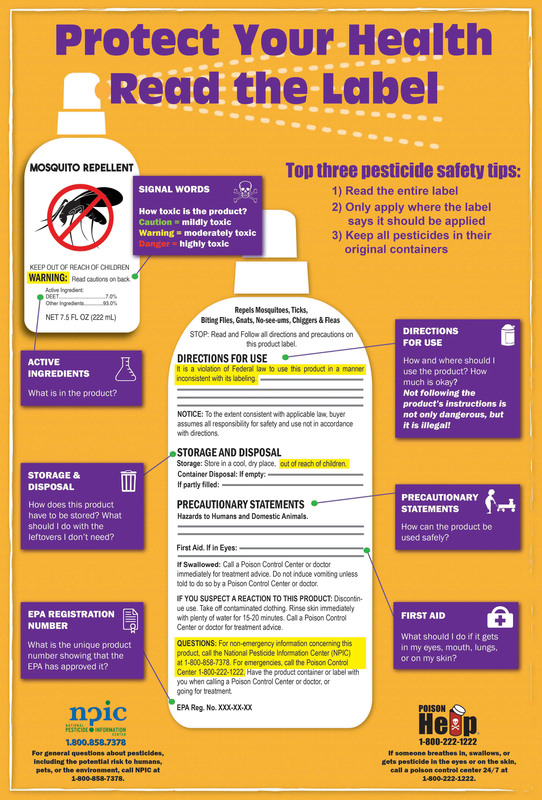 For help reading a pesticide label, visit the National Pesticide Information Center. We have been thinking a lot about ticks these days, so we are particularly grateful to our guest contributor, Paul Hetzler, for writing about another blood-sucking ectoparasite – mosquitoes. Hooray—it’s the end of April and the snow has mostly receded. Before it warms up too much, though, we really should try to solve our attractiveness problems. I recommend doing this through some tweaks to our attire, diet and lifestyle. With all the bloodthirsty mosquitoes outside, there is no sense being more alluring than necessary. The Asian Tiger Mosquito (Aedes albopictus) is an invasive day-biting mosquito from Asia. We are lucky in Northern New York that of the approximately 3,000 mosquito species on the planet, fewer than 50 live here. (If only that was the number of mosquitoes, not species.) Some, such as the Culex species which carry the West Nile virus, overwinter as adults and can appear on the first breath of spring. Most spend the winter in the larval or egg stages, and may take a week or more before they take to the skies in the spring. 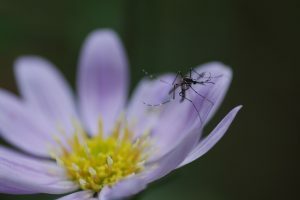 An article which appeared on April 16 in the Proceedings of the National Academy of Sciences spilled the beans on what mosquitoes find most attractive about us. Number one on the list of what drives female mosquitoes wild: unwashed socks worn for several days by malaria-infected children. You may as well take those out of your sock drawer right now. That particular study, by the way, was aimed at finding the best chemicals to use in mosquito traps, not at giving practical wardrobe advice. Because all mosquitoes are annoying, and a tiny fraction of them (two species in the U.S. at the moment) can transmit life-threatening illnesses such as the Zika virus, they are the subject of a lot of research. It is good to separate fact from fiction regarding what mosquitoes like and what they don’t. They like compounds we give off, especially carbon dioxide. Aldehydes are semi-aromatic chemicals, mostly naturally occurring (formaldehyde is an exception; mosquitoes do not fare well in that) on out skin, especially after a beer or two. Lactic acid, another ’skeeter treat, accumulates on our skin when we sweat. We can rinse often, or maybe skip the drink at a cookout, but some things are harder to avoid. Most people like to exhale on a regular basis, for example. If you have Type O blood, tough luck—you’re a ’skeeter magnet. Type A blood on the other hand, is not at the top of mosquito menus. And expectant women can expect twice as many visits from mosquitoes than those who are not pregnant. DIYers can treat their own clothing with permethrin. Be sure to read and follow label directions carefully. Where ’skeeters are concerned, the best defense is a good defense. Clothing that is factory-treated with the insecticide permethrin is excellent at repelling both mosquitoes and ticks. It remains effective for months, through dozens of wash cycles. Permethrin spray can also be purchased at hardware stores for use on clothing and gear. Just don’t use it on your skin. While botanical oils are not effective against ticks, many do keep mosquitoes away. Eucalyptus oil in particular seems to be one of the best. The down side is that they are often only effective for one to two hours. Apps available for mobile devices claim to keep biting insects at bay, but evidence shows they do not work. Not even a little. And though some people swear by home remedies such as garlic or B-vitamins, repeated trials indicate these are also of no use as repellents. Since these are good for you, in moderation, there is no need to quit — just use something that works in addition. I always assumed mosquitoes whined to raise the blood pressure of their victim to ensure a fast fill-up. Apparently that is how they communicate — their antennae sense this vibration. In one experiment, if female mosquitoes did not whine, the males paid no attention to them. In case you think mosquitoes have no redeeming quality, they actually pollinate certain flowers. The males in particular, which do not drink blood, can be found visiting sunflowers if you go out at night with a flashlight. Just leave the beer at home. 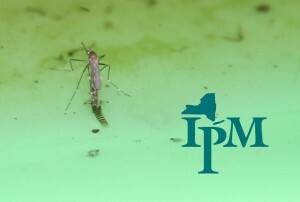 For more information on mosquitoes and using IPM to prevent them from breeding near your home, visit https://nysipm.cornell.edu/whats-bugging-you/mosquitoes-and-other-biting-flies. Paul Hetzler is a natural resource and horticultural educator with Cornell Cooperative Extension of St. Lawrence County. Its creators call this a billboard. 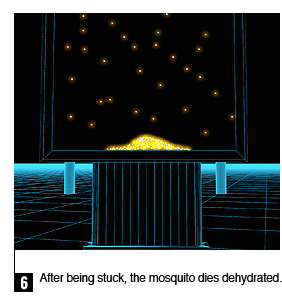 And while it has much in common with the classy, upscale billboards now peppering cities and towns around the world, this particular model is actually a sophisticated piece of equipment — built to attract mosquitoes from more than a mile away. The goal: to intercept and kill mosquitoes — specifically Aedes aegypti and kin — that might otherwise be inclined to sup on us. The other goal: to slow the spread of Zika. Zika is a relatively new mosquito-vectored virus. It hopscotched through Africa and Asia starting in the late 1940s, seemingly to little effect. But circa 2013 something changed. Outbreaks in Southeast Asia and several Pacific islands — where in French Polynesia the virus was linked to the neurological disorder Guillain-Barré syndrome — had scientists sounding the alarm. Then in 2015 came Brazil. Zika hit the big time and ballooned out of control. And along with the link to Guillain-Barré came a second: to microcephaly in the brains of newborns. Hundreds, perhaps thousands, of newborns. These links between mosquito-vectored Zika and severe neurological damage have yet to be proven, but few are in the mood to wait before taking action. Which is why two unlikely actors — NBS, a Brazilian ad agency, and billboard designers Posterscope (with offices in 34 countries) — collaborated on their Mosquito Killer Billboard. The billboard’s job: to attract mosquitoes with lactic acid (mimics human sweat) and CO2 (mimics human breath). The collaborators are demoing two of these billboards (the only two in existence) in Rio de Janeiro. Which means the jury is out on will they work on the scale they need to. But the billboard’s Creative Commons license provides a blueprint that allows anyone, anywhere to replicate the work the designers put into their prototype. 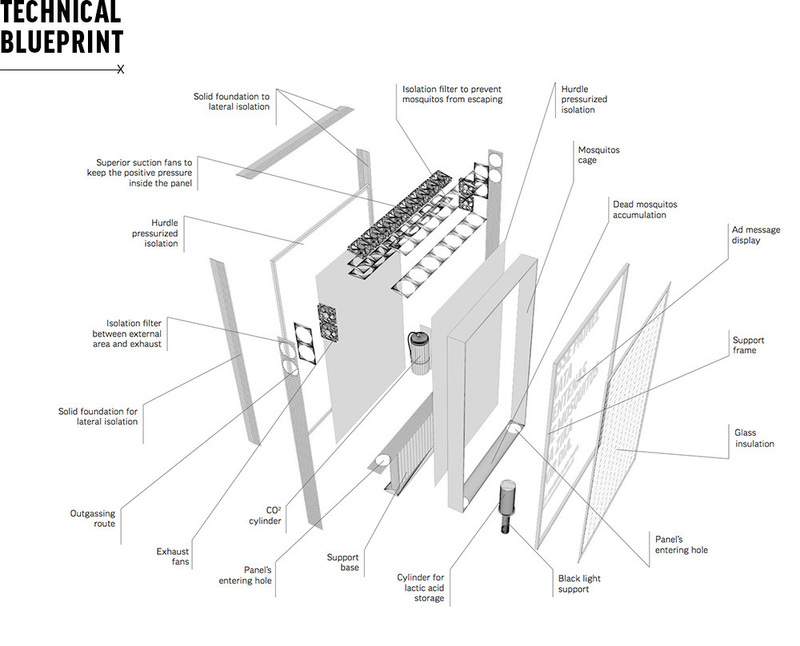 Killer billboard’s innards suggest DIY potential — if you have the skills. Does this even matter to people in the Northeast? Rest assured. Aedes albopictus, aka Asian tiger mosquito, can also transmit Zika. 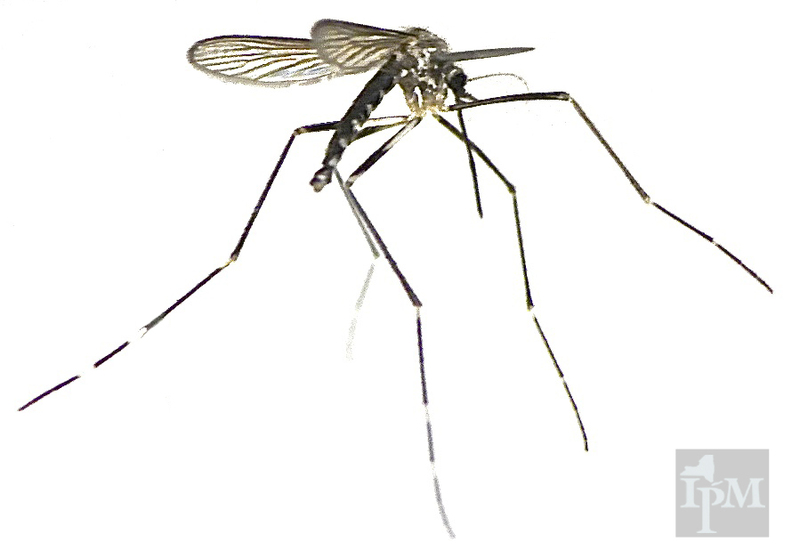 This globe-trotting mosquito made landfall in the U.S. in 1985 and has spread widely through the Southeast, arriving in Long Island, the metro New York area New Jersey, Connecticut, and Rhode Island roughly ten years ago. Under laboratory conditions it vectors an impressive suite of diseases, though only a handful affect humans. Still, that handful could prove worrisome if the tiger mosquito proves as competent a vector as its cousin A. aegypti. One factor in our favor is this: tiger mosquitoes like supping on birds even more than on us, which should lower their vector potential. But while both species are well adapted to urban lifestyles, A. aegypti prefers warmer zones in the southern U.S. For Zika, this makes A. albopictus the most likely vector of choice for people in more northerly areas. Right now the best advice is to learn everything you can about Asian tiger mosquitoes and stay informed. Check the CDC’s website often and follow recommendations for keeping yourself, your loved ones, and your community safe. 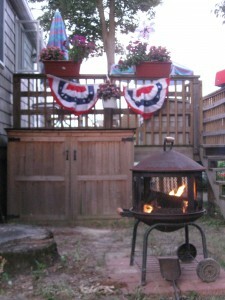 Summer is the season that brings us outdoors to enjoy picnics, barbecues and campfires. Unfortunately, blood-feeding arthropods such as mosquitoes and ticks can ruin our outdoor experiences by making us itch or by spreading disease. Over-the-counter sprays are one way that people avoid a forced retreat to the indoors. Choosing the right product and understanding how it works is important to keep you and your family safe. Here are a few considerations. 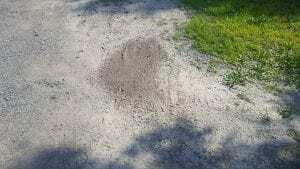 Repellant vs. Pesticide. There are two classes of products that you might see on the shelf. Products that contain DEET, picaridin, oil of lemon eucalyptus and IR3535 are repellants. These products interfere with the host-finding abilities of biting insects, making you hard to find. On the other hand, products that contain permethrin are pesticides that kill these organisms on contact. Permethrin is used to treat clothing, hats, shoes, and gear (backpacks, tents, etc. ), and should never be applied to the skin for safety reasons. Repellant Formulation. Repellants differ in their effectiveness at keeping pests away. On the bottle is a “percent active ingredient” listing, which is a measure of how long the product will remain effective. The higher the percentages, the longer it lasts. In general, products with less than 10% active ingredient provide only limited protection (1-2 hours at most). Here are some specifics about two of the common active ingredients. DEET comes in concentrations from 4 to 100%. Despite this broad range, studies have shown that concentrations over 50% do not provide any additional protection. Therefore, products with 20 to 30% DEET are recommended for outdoor exposure of four to five hours. Picaridin concentrations range from 7 to 20%, with a 20% concentration providing four to five hours of protection (equivalent to DEET at the same concentration). How to Apply. For repellents, use just enough product to cover exposed skin and clothing – do not over-apply. Never directly spray your face, but rather spray your hands and apply to areas as needed. Follow label instructions carefully for applications, especially for children. Treatments using permethrin to protect clothing should be done outdoors in an area with limited wind. Treat materials according to the label, paying particular attention to the amount of time needed for the product to dry. In most cases, once the material is dry, it is safe to wear. Additional information can be found on the TickEncounter website, including information about having your clothing professionally treated. Clean Up. After outdoor exposure, a shower is recommended to remove repellants applied to skin. This should be followed by a tick check. See TickEncounter’s Shower Cards for more information. Other Options. Screenhouses and appropriate clothing, such a long pants, long-sleeved shirts and a hat can be utilized to reduce problems with biting insects. Visit the following links for information on managing mosquitoes and ticks in your yard. After a long winter, warm weather is a welcome change. But no season is perfect. The air is abuzz with the zzzzzzzzzzz’ing of mosquitoes, a small insect that more than makes up for its size in its capacity to annoy. But mere annoyance is not the extent of the problem with mosquitoes. Itching and swelling are one thing. Mosquito transmitted diseases are another. West Nile Virus (WNV) and Eastern equine encephalitis (EEE) show up annually in New York. As of July 10th, WNV has been reported. EEE has not been found yet. No reports of human positive cases have been filed. (Interested? 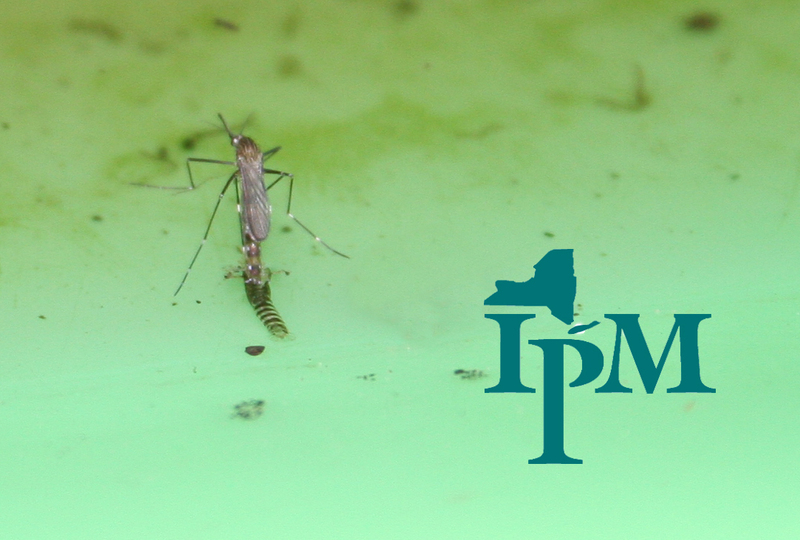 Follow reports at the NYS Department of Health: Mosquitoes and Disease). 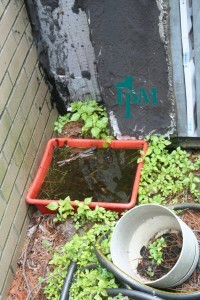 Conditions conducive to mosquito breeding. 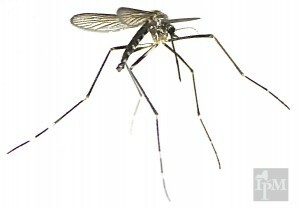 The most common mosquito is Culex sp., which has a very small territory. It usually stays within 300 feet from its breeding site — so ensuring there are no breeding sites on your property can go a long way in protecting you and yours. These mosquitoes aren’t picky about where they lay eggs. Almost any standing water will do. In fact, a bottle cap full of water can provide a breeding site. 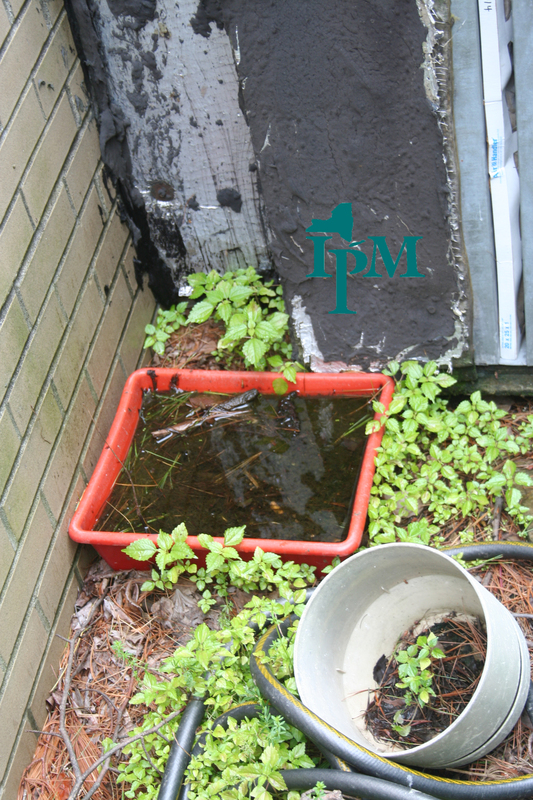 So check your yard for water in containers, tires, tarps, boats, children’s toys, rain gutters, bird baths, and unfiltered pools. Don’t forget to check your recycling bin. When you find standing water, simply dump it out. 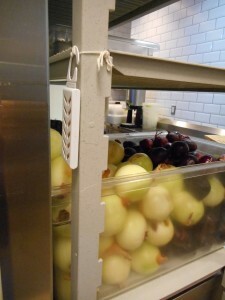 (This just might be the easiest IPM solution ever!) 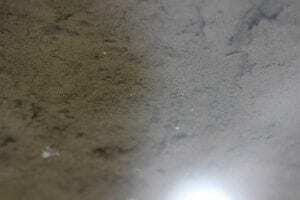 Any existing eggs and larvae will desiccate and die. The next step? Be sure that water can’t collect in that area again (what a great excuse to clean up) — or regularly dump, clean, and refill items such as birdbaths and children’s pools. This female mosquito emerging from its pupal case was found on a plastic sled that was put out of the way for the summer. 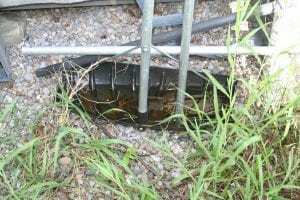 Dump any standing water and put the sled in a storage unit to prevent this from happening. For more information on mosquitoes and how to protect yourself, please read our publication, What’s all the Buzz About Mosquitoes, also available in Spanish. Metro-New Yorkers can count on mosquitoes being even more of a hassle this year. Wherever Hurricane Sandy carved belowground gullies, however small, beneath streets or buildings — mosquitoes will find them. That’s because the rainwater that pools underground provide all the room these mosquitoes need to lay eggs. Inform Yourself 1: Life cycles are a great place to start. BTW, those mosquito pupae — they have a trade name too: tumblers. Which suggests how they escape predators even while they’re turning into adults. those secret nurseries. Within a couple of weeks you’ve got a whole lot more mosquitoes. Similarly, city streets don’t provide the right habitat for mosquito predators to keep these adults in check. Ticks could pose a parallel problem. Sandy left piles of stalks and leaves from coastal grasses and reeds — even from people’s lawns and gardens — all along the shorelines. Inform Yourself 2: Deer ticks are born survivors. Even at temperatures as low as 38°. they’re out and about looking for a meal. Remember this next winter. These “debris fields” make great hiding places for ticks. Ticks can latch onto birds, then drop off far from shore. Even mice could carry ticks inland. 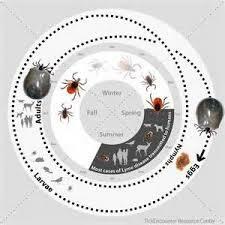 Many mosquitoes or ticks don’t carry West Nile virus or Lyme disease. But since both diseases can bear such nasty consequences — Lyme disease especially — knowing what to watch for and what to do is critical.